The schedule was changed this morning so that PAP3 could be redeployed. The deck crew will need all the available space for the PAP1 deployment which will now be just after mid-day. The redeployment went smoothly and PAP3 is now firmly in place. Next on the schedule was the Bathysnap deployment. This is a rig with a timelapse camera system which will be recovered in a years time. I filmed the deployment and got the splash moment. With the deck cleared the sensor frame was readied for deployment. 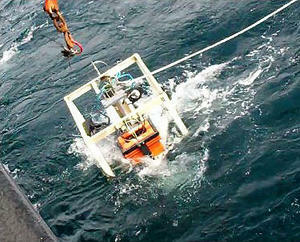 It was attached to the chain under the flotation buoy, then the mooring line was attached to the sensor frame. Three winches and three cranes were used to gently manoeuvre, and then lower, the surface buoy and the sensor frame into the water and then the 6km of mooring rope was steadily reeled out over the next four hours. The buoy was well out of sight by the time the anchor weight was let go.